How to share your family history with your family.--How? ›Start with what you know but don’t wait until you feel like you know everything. ›Know what interests and hobbies they have. ›Have a good relationship with them. My grandfather, bless his heart, would sit the grandkids down when I was about 8 (I was the oldest grandchild) and have a "talk" with us. He did the former but he didn't do so well with the latter. I remember being really squirmy and I don't remember anything he said, except that it was important to him and I was supposed to sit still. What I would give to be able to have a talk like that with him now--but my attention span is different now. Start with an attention getter. ›Photos, games, stories are generally good places to start. Don’t underestimate their abilities and interest level. Leave them something to figure out. Every little encounter is a little more they know about their family. When one comes, others will follow. If you are excited about it, and if you have a good relationship, they will be more inclined be excited about family history too. If you make it part of your life, and they are involved with your life, it can come naturally. It doesn't have to be an event (although it can be). Teaching your family about your family's history can be a way of life that evolves over time--something you just are because you know where you come from. How to share your family history with your family.--Why? 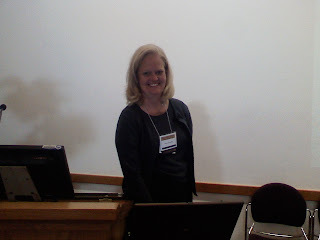 I taught my lecture "How to Inspire your Family with their Family History" Sunday at the Family History Library at BYU. The students there appreciated it and got me thinking in several new directions on the topic. So, I thought I would share some of it with you here over the next couple of weeks and get your feedback as well. I'm going to file this new series under "Sharing your family history" so it will all be there to refer back to. I start out the lecture with a discussion about why sharing your family history with your family is important. This can include your descendants--children, grandchildren, nieces and nephews; and your contemporaries--brothers and sisters, cousins; and even your ancestors--parents, aunts and uncles, and grandparents. Hopefully these posts will give you lots of ideas for sharing your research with all of the above. Family History bonds families together. ›It will strengthen their relationship with you. Family History can give a sense of belonging. ›They will have a stronger sense of who they are, what their place is in the world. Family History can create a loving, safe environment. ›They will know that there are people who love them and worked so that they could have a nice life. Family History can give them something to live up to. Family History can inspire a sense of gratitude. ›They will know how much easier life is now. Family History can help them with their problems. ›Somebody has probably been there before and survived it. Family History can give them a broader, more unselfish perspective. ›They will see the bigger picture of the span of life. Family History encourages good skills. ›Logic, detective skills, writing, communication, organization. Family History gives a context for other knowledge. ›History geography, languages, religion, culture—Margaret Mitchell, Alex Haley, inspired by their family history. I've often thought a family's history would be a wonderful context for a home-school curriculum. I wish that fit with my family's needs. You could use some help. ›They might break through your brick wall someday. It will be moving for you to see the span of your family reaching out/down. ›My perspective on my life, history, and the span of our family is amazing when I see my children involved. You may find someone who will carry it on. ›No one will care about your research work more than your own family can. In the posts to follow, we'll talk about how, and I'll shower you with all the ideas and resources I have collected for how to make it interesting to those people who can be most affected by your family's history. 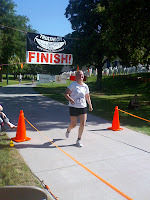 This has nothing to do with genealogy or Generation Maps but I have to tell you--I finished my first triathalon today. 2 straight weeks of conferences and then a vacation wreaked havoc on the end of my training schedule. I got engrossed in a movie last night and didn't get to bed at a decent hour. Accidently slept in and almost didn't make it on time. Didn't get in line for a while so I started almost last. Passed a few people. Almost as many as passed me but hey I'll take what I can get. Have the number 119 "body art" to wear to church tomorrow. Have a triathlon t-shirt that I might never take off. Started almost last but didn't finish last. Woohoo. I'm looking forward to seeing my time. I actually think I might not have done too bad for the first one. Had some good music going. --I think I actually enjoyed myself? Did I mention I finished? Next one is October 18th. Many thanks to the incredibly supportive family and the good friends who actually waited for me to cross the finish line. Hopefully I inspired my kids. I guess it *is* a little like family history. I took a break for a little bit but I have a good post to come back to. 10% off everything at Generation Maps until September 10th. Working charts, Decorative Charts, from your data, from New FamilySearch (if you have a log in), Canvas Giclees, Blanks Charts, etc. Great if you still have a family reunion coming this summer, or to stock up on Christmas presents if you are one of those people who start early. Just enter "blog10per" in the Promotional Code field when you check out. Or mention it in any phone calls, free consults, or e-mails. I also hit my 100th friend on Facebook last week. There is a great genealogy community there to laugh and talk with. If you haven't signed up, you should. It is so fun to keep in touch with everyone and know what is going on. When you get there, be sure to friend me and become a fan of The Chart Chick Blog and Generation Maps Genealogy Chart Printing Service. My picture for the Carnival of Images is of Marie (Mary) Josephine Kostal born 16 May 1859 in Novosedly, Strakonice, Jihocesky Kraj, Czechoslovakia and her husband, Frantisek Josef Hovorka born 22 Dec 1857 in Trebesov, Rychnov, Nad Kneznov, Czechoslovakia. This is the family history picture I couldn't do without because these are the people who brought our family name to the new world. The oldest picture we have of any Hovorka. 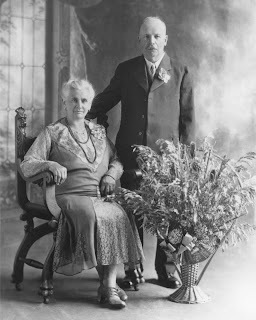 They were married on 22 Jun 1879 in Chicago, Illinois. This picture was taken for their 50th anniversary in 1929. The floral arrangement in the picture was spray painted gold and displayed in their living room after the anniversary. They lived on a farm along the Wisconsin river and after their deaths, the farmhouse had to be moved when the Castle Rock Lake Dam was built and the lake formed over their farmland. Frank was known by relatives as Gede, short for Gedecek, or grandfather. I often look at this picture and hope that we are making them proud of what we are doing with the Hovorka name. Check out our Kim in the My Ancestors Found video. And come to the conference. We'll be printing on site. Well we are at another conference. And again, getting ready for the conference slowed down my blogging, but now that I'm here I can talk more. I love talking to people at the conferences we do. And I'm glad I have this extension of that. I promised this last summary of my "Will your work survive the digital age" series. What options do you have when the worst happens and you lose your digital data? Again, this is a huge topic and even a huge industry that I'm going to try to squeeze into a blog post. Here we go. In data recovery, the biggest point is to BE CAREFUL NOT TO WRITE OVER THE FILES. They are probably still on the memory device, you just may not be able to access them. There are programs that you can buy that will help you to recover data on your hard drive.We have used File Scavenger (about $50) and it has worked well for us. New operating systems also sometimes have built in back up systems. Windows XP and Windows Vista have roll back capabilities if you enabled them. Or, you can also take your computer to a Data Recovery professional. These can get pretty expensive but are worth every penny when the data you need is priceless--which family history often is. When the data is not on a hard drive but on an external device, like a CD or travel drive, recovery is sometimes easier. Again, File Scavenger can restore some external files. Snapfiles.com also has other file recovery utilities. Sometimes just trying another machine or cleaning might help. There are polishing tools that can help, or professionals may be able to remove scratches and make the tool readable. And again, Data Recovery Professionals can be lifesavers and worth every penny. When you haven't lost the data, but just can't use it because your software won't read it anymore, you need Emulation. Emulation is re-establishing old computer programs. Many Libraries and Digital Repositories are working to save old computer systems and software so that we can revive old programs in the future. Family History Centers usually have old versions of PAF and other software, and old floppy disk drives. These serve a great purpose and can be really helpful when you need them. Hopefully they will always provide that service. Will your work survive the digital age--the Digital Dark Age. Will your work survive the digital age--Naming, Tagging, and Filing. To avoid a Digital Dark Age in this generation, we must ensure that our digital records are accessible and useable for the future. The way we manage the records we create has to keep pace with digital record creation. You can make a difference in your family by doing your best to preserve your own documents. With attention and a plan, we can preserve our records and not become the Digital Dark Age generation. BEING ABLE TO FIND THE FILE MAY BE AS IMPORTANT IN THE FUTURE AS MAKING SURE THE FILE SURVIVES. As I started on this lecture, this is an idea that I found that really surprised me. It makes total sense though. I don't know how long you have had a digital camera, but if you have had one very long, you know how those picture files stack up. And then when you are looking for one, it takes a while if they are still named "img10034.jpg." So your files may all survive the next 10 years fine (if you follow the first 4 principles we have been talking about) but you may not be able to find what you need anyway. That is a good start. But in 10 years I'm going to have too much and need to come up with another system. Just like in a good library, the more consistent you are the easier your system will work for you. I know someone (who shall remain anonymous) who makes new file folders all the time titled “new” “to print” “latest” etc. -- titles that are temporary. You think you will go back through and change them, but most people don’t. A year later, those file folders are full of all sorts of unorganized stuff. The problem compounds over time and then you have a mess to clean up on your computer so that you can find anything. So, computer filing systems are like any filing system—like keeping a house or office clean. Just set a scheduled time to file—every day or even quarterly. One more post to come: What to do when the worst happens. MIGRATION ISSUES ARE SOLVED BY BUDGETING TIME AND MONEY. Continue to migrate all electronic files to the next computer and medium--Have a plan and set a time frame for migration. If possible, annually budget for new computer systems and software, even if the budget is small. Staying relatively current solves technology advancement problems. Combat digital obsolescence by staying current with the technology and making sure that all files are converted to new formats. Emulation can help when files become obsolete. Many Libraries and Digital Repositories are working to save old computer systems and software so that we can revive old programs in the future. For genealogists, Family History Centers usually have old versions of genealogy programs, and old floppy disk drives. These serve a great purpose.